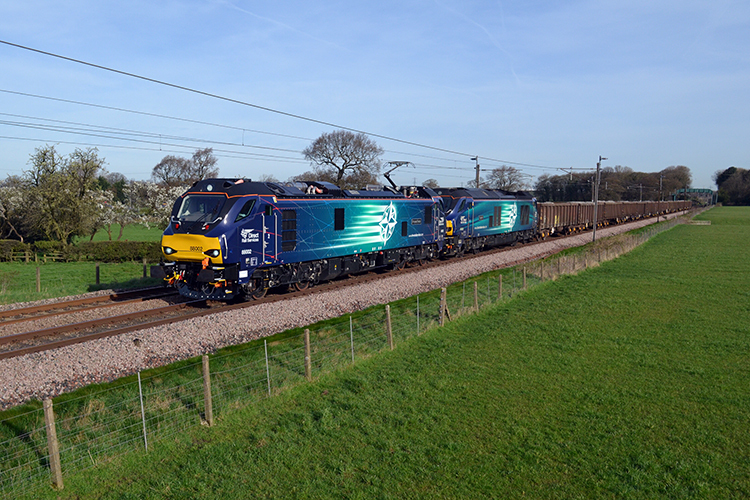 In September 2013, Direct Rail Services placed on order for ten type UK DUAL electro-diesels with Vossloh via Beacon Rail Leasing. Designated as Class 88, the locomotives are suitable for electric operation under 25kV overhead power systems and for diesel operation thanks to a 708kW Caterpillar C27 diesel engine. Maximum speed of the Class 88 is 160km/h, making it suitable for both freight and passenger services. Its diesel engine enables the loco to operate the last mile at unelectrified terminals and sidings. Additionally, DRS expects the locomotive to be suitable to operate as light mainline diesel locomotive.